Thurston Principal Natasha York introduced Dr. Swift to parents attending a school meet-and-greet on Sept. 3, 2013, the first day of school. Dr. Swift toured nearly a dozen schools that day. 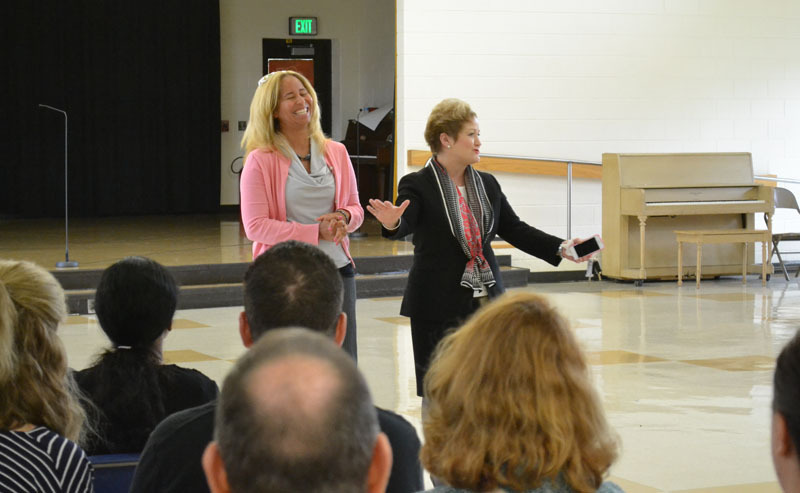 Superintendent Dr. Jeanice Swift is touring neighborhood schools to meet with staff and families to learn what matters most in the AAPS community. Over 30 forums are scheduled and listed below. If you are unable to make your school’s night, please feel free to attend any other of the scheduled events. During each visit, Dr. Swift will first meet with staff at the end of the school day and then she will meet with parents and families in the evening. What is going well in the district and what are we proud of? What do we dream of and hope to achieve for our children and AAPS over the next 10-15 years? What are the top 3 priorities you would like Dr. Swift to address? Please note all meetings take place from 6:30 to 8 p.m.